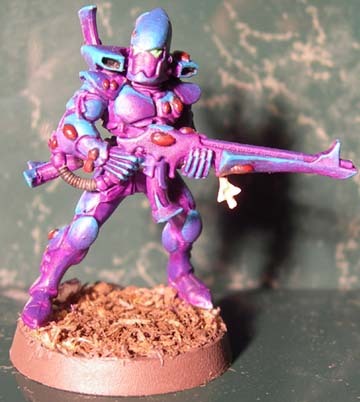 This is a tutorial on how to paint Verloren Eldar. First of all you will need a model plastic or super glue flock Reaper dragon white Reaper emerald Reaper blood red Reaper blood stone Reaper volcano brown GW Liche Purple GW bronzed flesh GW black ink ok now first things first. The first step to painting a model is always assembling the model and cleaning it. 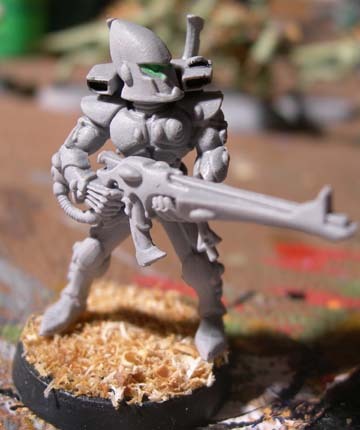 After you have cleaned your model free of mold lines and assembled it, prime it. I like to flock the base before I attach the mini to it. 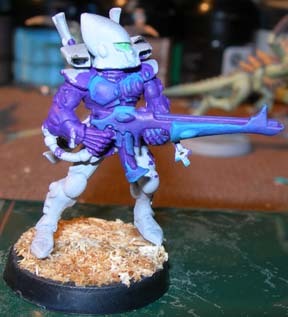 After your mini is assembled, cleaned, primed and secured to its base you will have something looking like this After this the first thing you want to do is paint the area behind the gun, and other hard to get areas with Liche Purple . This will help prevent you from messing up nicely painted areas later on. After you have painted the chest and the back side of the gun, and other hard to get to areas you can begin painting the chest. 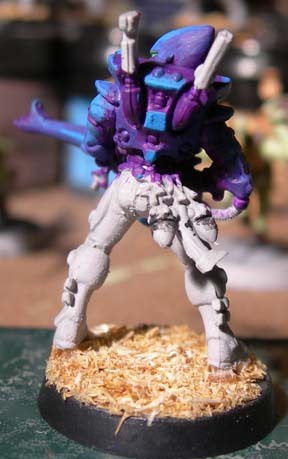 To paint the chest first of all paint the neck, underside of the helmet, and chest with Liche Purple . Now while the paint is still wet begin to highlight the chest with Reaper's bloodstone. After you have done this it will look something like this. 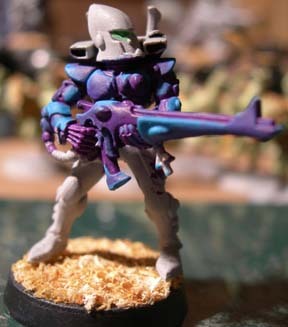 After painting the chest I paint the gun. 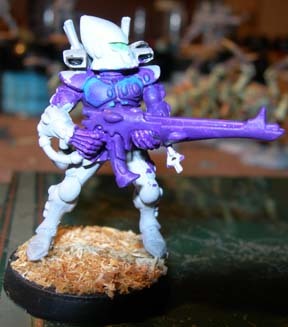 start off by painting the entire gun (and hands) Liche Purple . 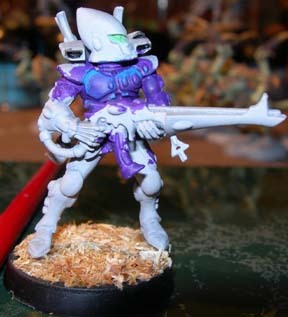 now while the paint is still wet begin highlighting the gun with Reaper's blood stone fading it to Purple towards the end of the barrel and the underside of the gun. Once this has been completed you will get something like this. After painting the gun I like to paint the arms, and shoulders. 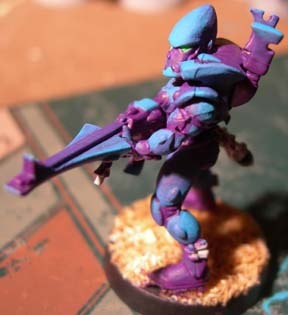 to paint the arms paint them with Liche Purple then while the paint is still wet highlight all raised areas using Reaper's bloodstone. 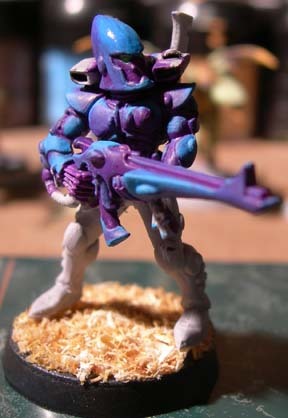 then paint the shoulders Liche Purple and highlight the edges with Reaper's bloodstone while the paint is still wet. 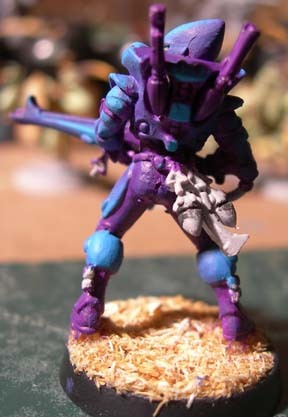 when this is finished it will look something like this I then go on to paint the helmet, first paint the eyes with Reaper's emerald, then paint the entire helmet withe Liche Purple . 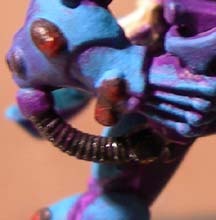 While the paint is still wet begin highlight the edges around the face with Reaper's bloodstone. You want to highlight the front of the helmet with Reaper's bloodstone as well fading to Liche Purple as you get to the back of the helmet. Once this is finished you will end up with something like this. After this stage I like to paint the top piece sides and back of the armour. To do this paint one part at a time. 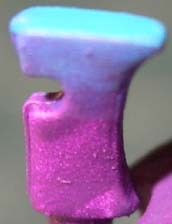 First make sure you have all recessed areas painted in Liche Purple . After this paint one side with Liche Purple . Begin to highlight around the air intake with Reapers bloodstone. 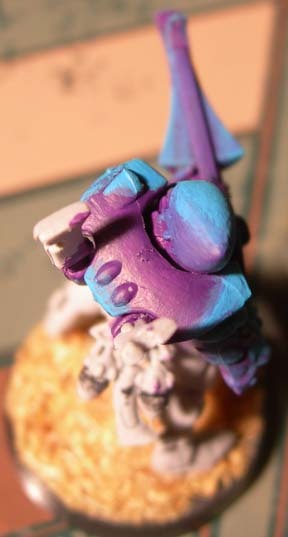 You want to blend to a blue tone and paint that on the rest of the side. When this is finished it will look something like this. To paint the top of the armour paint around the edges of the air intake with Reaper's bloodstone. You want to paint in a swooping shape, paint more bloodstone on the front then make a sweep so it gets thinner towards the back. Once this is done you will have something looking like this. 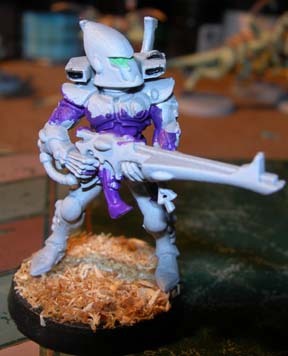 After this simple paint the raised areas on the back with Reaper's bloodstone to get something looking like this. After this you can begin to paint the legs. 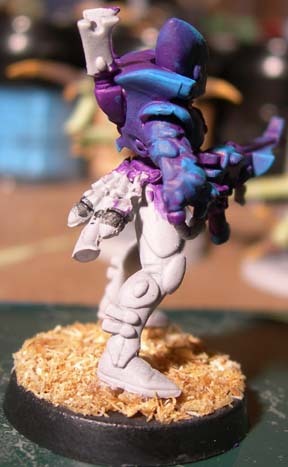 To do this paint the entire leg with Liche Purple and begin highlighting the side guards and knee pads with Reaper's bloodstone lending them to the same blue as on the armour's sides. After you have done this on both legs you will get something like this. After this I finish painting the guards around the lower legs in the same way and highlight the pants with Liche Purple mixed with a slight amount of Reaper's Bloodstone. 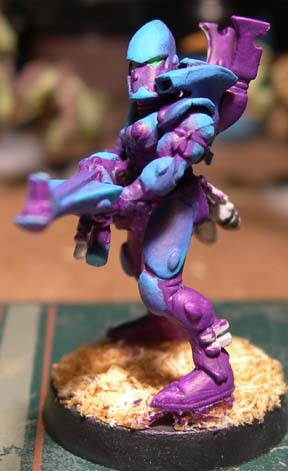 This makes a slightly blue colour and is slightly darker then the Liche Purple and gives it a neat effect. After that is finished it should look something like this. 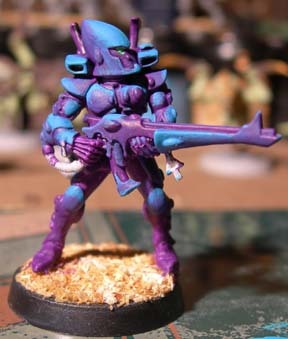 After this you can paint the antenna, by simply painting them Liche Purple then painting the tops with bloodstone and blending them to Purple . Once this is complete it will look like this. Next is to paint the ammo belts. Paint the magazine same as you did on the gun. Paint the crack in the grenades with black ink. After this has dried paint the grenades themselves with Reaper's bloodstone. Once this is finished it will look like this. The next step is to paint the NMM gold. To do this paint the gold pieces with bronzed flesh. You then want to drybrush the edges of the gold with elf flesh. Finally you want to paint the tips with dragon white. When this is finished it will look like this. Next is to paint all the gems. To paint the gems, mix some blood red and black ink to make a dark red. Apply this red to all the gems. After you have done this go back and paint the lower part of the gem with blood red. Also drybrush Bloodstone on to the ridges on the hands. When you have done this it should look something like this. After you have done this paint the tube going from the gun to the arm with black ink. After this paint your base. Once your base is dry you want to clear coat the mini, After the clear coat has dried I paint a clear gloss coat on all the gems. Once this is finished it should look like this. I hope this tutorial has helped, and you have enjoyed it. Until next time this is wolf fang... signing off. copyright 2006, Mike (Wolffang) Kovosi, all rights reserved. Thank you Wolf Fang. Interestingly (for me), this is almost the exact same paint scheme I use. 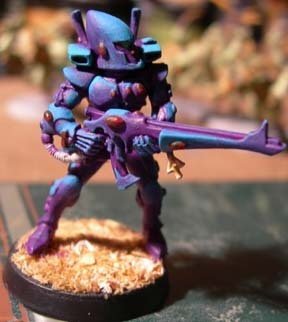 I figured the different tone highlight really adds an unusual/alien/fey look to it which worked perfectly for Eldar.